When I was about six or seven, we got a big box delivered to our house. I have no idea what was in that box, but I can tell you what I did with that box. I was fascinated by computers. In those days — this was a long time ago — computers were big standing boxes with flashing lights. So I cut small holes in that box and got a strand of flashing Christmas lights and taped the lights in the holes with duct tape. Then I climbed inside the box for some fun. My computer was a special kind. Kids or adults would stand outside the box and ask a question. I would make some “computer noises” and respond to the question in my best computer voice, with the lights flashing. The adults asked boring questions, like “What is 2+2?” The kids asked more interesting questions: “Will Roberto Clemente hit a home run tomorrow?” or “Why is this computer so dumb?” I was always happy to answer any question with the power and authority I felt in that box. If only real computers worked this way! This kind of pretend play is as much fun as it is good for children’s learning. John Medina, author of Brain Rules for Baby, says that kids who play this way end up more creative, better at language, better at problem-solving, less stressed, better at memory, and more socially skilled.1 That’s a pretty good list! One of the best ways you can encourage and enrich creative play is to create a space with simple and delightful materials and props for your children. Some people like to build fancy play areas that would look good in Architectural Digest magazine. Don’t do that! Build a play area for the children themselves. And what should it look like if you want to encourage creative play? 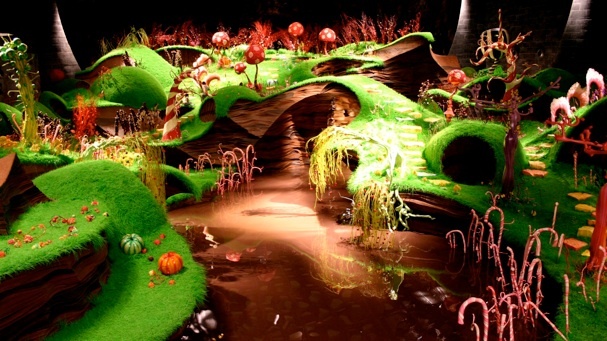 John Medina uses the image of the chocolate factory from Roald Dahl’s book Charlie and the Chocolate Factory. It’s a delightful place with all sorts of goodies, including edible grass and a chocolate waterfall.2 At least, that’s the feeling you want your child to have in your play area. Other ideas: fabric of various shapes and sizes, dolls, simple dollhouses, plastic soldiers for battle scenes, simple train tracks and trains, cars, planes, duct tape, a few tools such as kid-appropriate screwdrivers and hammers, sheets (for making forts), pillows (for jumping on) … you get the idea. It’s not that you need particular things in your Chocolate Factory. It’s that you need a variety of items that capture your child’s imagination and let her create whatever they dream up. None of it need be expensive! With a Chocolate Factory, plenty of free time for messing around, and a little encouragement, who knows what planet your children will find themselves on — it’s bound to be good! John Medina, Brain Rules for Baby: How to Raise a Smart and Happy Child from Zero to Five, pp. 131–132. ← In Praise of (Brutal) Board Games!